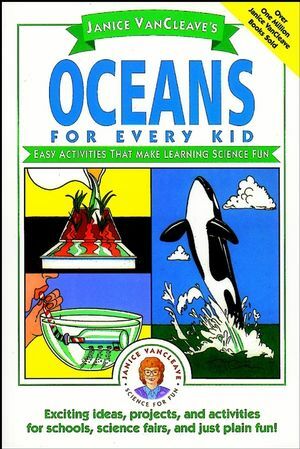 Now you can discover the answers to these and many otherfascinating questions about the ocean--the earth's last frontier.Janice VanCleave's Oceans for Every Kid makes learning about theocean and its inhabitants an intriguing adventure. Use a bottle,pennies, a straw, and clay to demonstrate how submarines rise. Makeyour own wave holder with index cards and a plastic folder. Throughthese and other activities you'll find out how fish move up anddown in water, how pollutants move into the ocean, how to navigatewithout a compass, how to map the surface of the ocean floor, andmuch more. Each of the activities begins with a statement of purpose followedby a list of materials, step-by-step instructions, expectedresults, and an easy- to-understand explanation. Every activity hasbeen pretested and can be performed safely and inexpensively athome or in the classroom. Drifters: The Distribution of Land and Water around theEarth. A Closer Look: The Techniques and Technology of Modern OceanStudies. Way Down: Determining the Depth of the Ocean Floor. Up and Down: Learning about Water Waves. Squeezed: Factors that Cause Water Pressure. Salty: Why the Ocean Is Salty. Changeable: How the Oceans Affect the Earth's Weather. Layered: Types of Ocean Life and Their Environment. Movers: Learning How Marine Life Moves. Ocean Giants: Learning about Whales.